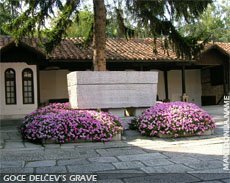 Goce Delcev (Delčev or Delchev), was born on February 4th year 1872 in Kukuš, Aegean Macedonia (today Kilkis). 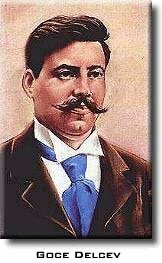 Goce Delcev was from patriotic Macedonian family, who gave more revolutionaries. His father was Nikola Delcev and his mother Sultana Delceva. He finished the primary school in the native place Kukuš. Later Goce Delcev worked temporary in his father's restaurant and in a small market place. Then Goce Delcev signed in the Male Secondary School in Solun (Thessaloniki). Goce Delcev lived in boarding school, and was wonderful and excellent student. Goce Delcev read a lot of books with socialistic, revolutionary and philosophic contents. Goce Delcev was a member of the Secret School Revolutionary Membership. In the summer 1891 Goce Delcev went in a military school in Sophia. During 3 years spent in the military school, Goce Delcev read a lot socialist and revolutionary books. In September 1894, Goce Delcev was expelled from his school activities. Actually, he finished his studies, with a diploma, but without the right of being an officer. 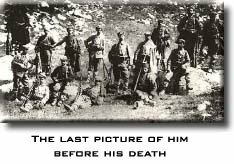 Goce Delcev was a patriot, who wanted, spend and gave his life to the national-liberation struggle for independence of Macedonia. In the spring 1894 Goce Delcev went to work as an teacher in Novo Selo near Stip, where Dame Gruev was already one. Here, Goce Delcev immediately became member of the Macedonian Revolutionary Organization and took part in the activity if spreading the organization network in the Macedonian cities. In those places Delcev created healthy and strong bases of the Macedonian Organization, created routes and puncts for transport of weapons, munitions and literature. From one to another place Goce Delcev established everywhere local committees of the Macedonian Revolutionary Organization. In the autumn in 1896, Goce Delcev moved to Banjsko, near Razlog, (Pirin Macedonia), where he worked again as a teacher. Here he didn't stop with the revolutionary work. His teacher's work was just a mask to all of that. While he was in Stip and later in Banjsko, after the school work Goce Delcev was the organizing of the revolutionary work. Leaving the school rooms, he was always traveling in the neighboring cities, where he had to put new members of the Macedonian Revolutionary Organization. And after a long period the Organization started to visit the villages. The Sunday's schools for adults, the churches and monastery yards were perfect spots for spreading the network of the Macedonian Revolutionary Organization. Thanks to Goce, the members of the organization started to increase very fast. By this activities, the feeling of being a one nation - the Macedonian, could be felt of every heart of every Macedonian, and that is time to get the more centuries occupier, the Turks out of here. In the spring of the year 1895, Goce made crosses to the bigger and well known Macedonian cities in that period, like Veles, Solun, Kukuš, Dojran, Strumica, Radoviš and in all of the villages near them. In those places, Delcev established local committees of the Macedonian Revolutionary Organization and added more new members to the organization. One of the most important is the work of Goce Delcev in the next summer 1896, when in Solun was the congress of the organization. Together with Gjorce Petrov they worked on the Constitution and Laws of the organization. Later the organization renames to Secret Macedonian-Odrin Revolutionary Organization (SMORO). In the constitution contained by 19 articles in for heads, can be followed the political programme of the Macedonian liberation art. The organization is internal Macedonian including and Odrin which wasn't still liberated from the Ottoman Turks, which is only one and will be leading with operations for liberation. Building the principle of souverenity and independence of the organization higher this organization was proclaimed as an political autonomy of Macedonia and Odrin. In that sense by the article 1st, SMORO had work to unite all in one, the unsatisfied population of Macedonia and Odrin, without matter of nationality, to start a revolution and the start with a liberation, as in Greece (1821) and Serbia (1878). In the period of 1896-1901, Goce Delcev joined by Gorce Petrov, was presenter of SMORO in Bulgaria. Target of this diplomatic mission on the both founders of the Organization, in Bulgaria was to protect the Macedonian Liberal War from the vrhovistic committee in Sophia and from the conquering routes of the Bulgarians. From the year of 1897 until his death, Delcev made again a several crosses in Macedonia and repeated them. This period in the historic science is known as "The big route of Goce Delcev in 1901/1902 in central, western and southern Macedonia, starting from Radoviš, then to the Tikveš region, in Prilep, Bitola, and finishing in Lerin (Florina) and Kostur (Kastoria). At the beginning of the year 1903, Delcev with his army crossed the regions of Serez and Strumica. In April the same year he had a trip to Solun, with a simple target, to tell Dame Gruev not to start the uprising soon because they are not ready yet. Because nobody even tried to listen to him, disappointed he went back to take part in the congress of Serez, and probably extradited by someone, was killed by the Turks in the village of Banica, near Serez (Aegean Macedonia-Greece), on May 4th 1903. "I understand the world, as a field for cultural competition between the nations."